QUECHEE—The Vermont Institute of Natural Science has re-opened its spectacular outdoor exhibit titled “Ice Age Mammals on the Meadow.” This year, the exhibit features an Irish elk, a dire wolf, a saber-toothed Cat, and a handful of mastodons. The sculptures will be on display in the VINS meadow for visitors to see through April 2017. Allow your imagination to explore the life-sized artistic works of artists Bob Shannahan and Wendy Klemperer. Through their artistic interpretations, as well as information about each animal, you’ll encounter a winter landscape naturally decorated with unusual and exotic creatures from over 11,000 years ago. Shannahan has been making and exhibiting his animals in New England for the past 10 years. They are an extension of his landscape work and his work with school gardens. Each life-sized animal is made of a wood and metal structure covered with local plant material. Brooklyn-based sculptor Wendy Klemperer uses scrap metals to weld together all types of creatures. 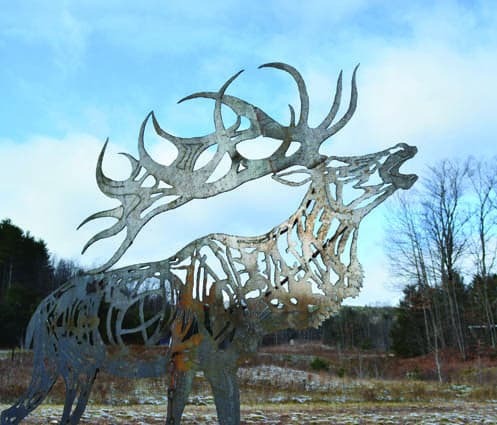 Klemperer has taught welded sculpture for over a decade and annually teaches a workshop at the Carving Studio and Sculpture Center in West Rutland. Her enormous eagle sculpture graces the VINS Nature Center entrance and her Great Horned Owl greets visitors to the raptor exhibits. The price of admission to the Nature Center is $14.50 for adults; $13.50 for seniors 65 and over; $12.50 for youth ages 4 to 17; and free for members and for children 3 and under. For more information visit www.vinsweb.org. Irish Elk by Wendy Klemperer is part of VINS’ outdoor exhibit, “Ice Age Mammals in the Meadow,” also featuring a saber-toothed cat, a dire wolf, and a few mastadons.